Valid authority in the Church derives from following the truth. Those aligned with God’s word are to be honored and followed,1 those who don’t are to be resisted, sometimes even publicly, regardless of their name, rank, or history. All valid authority comes from adherence to God’s word, not an ecclesiastical or educational title. Abraham lived in Haran when he heard God’s call on his life. Terah, Abraham’s dad, had years before moved the family from Ur, about a thousand miles away. As far as Abraham was concerned his faith adventure started in Haran but not according to God. Ur was from where God said he brought Abraham from. Circumstances and events in our lives are not random events until we find Christ, from our very beginning God is actively involved orchestrating our character, composition, and desires to bring us to himself. 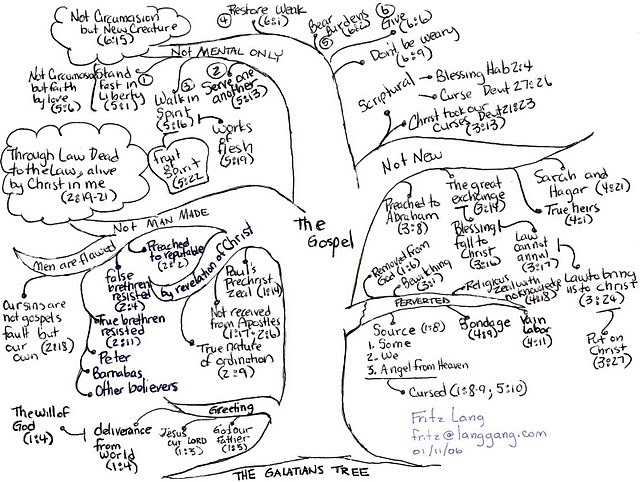 Paul’s letter to the Galatians represented, graphically, as a Tree. >The World, evil or just misunderstood? Here’s the crux of our struggle – We see our world not as evil but just in need of reform. We want to enjoy all the good this world offers and fix its problems. God’s answer is not reform but deliverance. Our sins render us unable to escape, like a man trying to pull himself up by his own bootstraps. Jesus gave himself for our sins1 , puts us into His Kingdom2 to obey His laws3 , to extend His rule where we have responsibility and authority4 , and to live as ambassadors for Christ5 to others who are, likewise, in need of deliverance.